MIAMI - A Miami doctor has been suspended and in danger of losing her job after a YouTube video showed her involved in a heated and physical argument with an Uber driver. 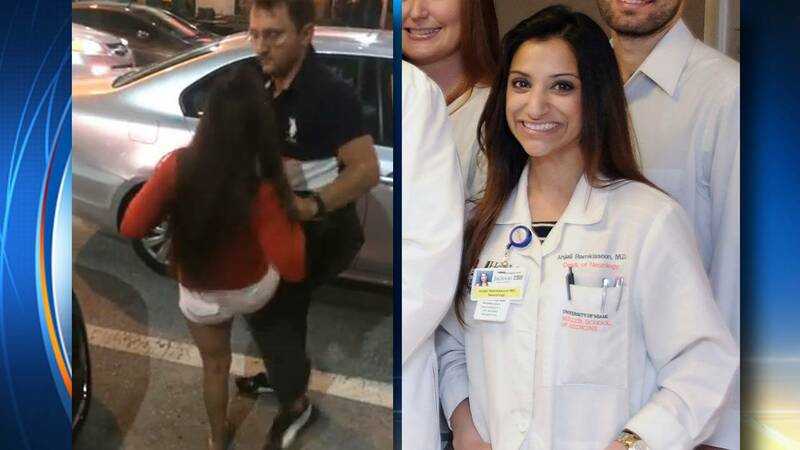 WPLG reports Anjali Ramkissoon, a fourth-year neurology resident with Jackson Health System, is shown on the video in what appears to be an inebriated state, berating and then attacking the unknown driver. It's not known what started the confrontation in the Brickell area on Sunday evening, but at the start of the video the driver asks nearby witnesses to call 911, while Ramkissoon makes the same request. In the video, Ramkissoon is seen attempting to slap the driver, and then kicks him in the groin area. After stumbling to the ground, Ramkissoon gets up and sits in the driver's car and immediately begins using vulgar language to berate the man to get in the car to drive her to her destination. Ramkissoon throws items out of the car, including scissors and papers, hitting nearby vehicles with the objects and yelling, "I have lost my mind!" Soon after, Ramkissoon gets out of the car, says goodnight and walks away. No charges have been filed, and there will be no further investigation by police, although Ramkissoon's employer will dig deeper into the incident. Jackson Health System says Ramkissoon has been put on administrative leave, effective immediately, and has been removed from all clinical duties. "Jackson has launched an internal investigation," the hospital said in a statement. "The outcome of the investigation will determine if any disciplinary action will be taken, up to and including termination." Uber has suspended Ramkissoon's account. "Uber expects everyone in our community to treat each other with respect and common courtesy, and we have a zero tolerance policy for all forms of harassment and abuse," a representative for the ride-sharing service said in a statement. "We have suspended this rider's account as we investigate the incident." A University of Miami spokesperson disputed that Ramkissoon was affiliated with the school, but offered no reason as to why she was wearing a University of Miami Miller School of Medicine smock in a picture that was posted on, and has since been pulled from the school's website. Copyright 2016 by WKMG ClickOrlando - All rights reserved.